At your finger tips, our walk-in cooler boasts seasonal and specialty flowers to ignite your imagination. Open to all customers, feel free to choose your own assortment or consult with any of our knowledgeable staff. Designer’s Choice, bright, seasonal cut flowers in a vase. 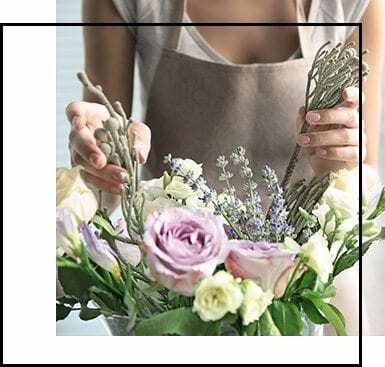 Made-to-order just for you, let our talented team of Florists create a unique and colourful vase arrangement with speciality flowers from our local Ontario and European growers. Arrangement comes in signature glass bowl vase, of a clear, high-quality glass. This fresh bunch is Spring in a vase. A classic glass vase with bright spring colours of fresh tulips (regular ~40 stems, large ~60 stems) is perfect choice to brighten up the day. Tulips are sourced from Ontario flower growers twice a week in a broad assortment of colours. Send the ‘Spring Message’ with a bouquet of 40 fresh tulips in assorted colours will bring a sign of spring to someone’s home. Tulips are sourced from Ontario flower growers twice a week in a broad assortment of colours. A creatively arranged Succulent Garden planted with an interesting selection of easy to care for succulents in a variety of sizes, colours and textures. Planted with decorative rocks and sand, this living centrepiece makes the perfect unique gift and will look great in any home or office. A classic gift for that special someone or for any birthday or special occasion. Available year round in assorted seasonal colours. Please call for colour availability or to arrange for to delivery. These long-lasting, elegant blooming plants are sure to bring tranquility and beauty into any space that they’re placed. These gorgeous, white waterfall orchids make an ideal gift or centerpiece for any home or office. Pots are subject to in-store availability. These mini orchids come in an assortment of white, green or other colours and are perfect as a token of gratitude or for a small coffee table. Potted in a stylish container, with lush moss on top, giving a soft, graceful feeling to any space. A gorgeous, classical garden-style arrangement. This elaborate arrangement is comprised of premium green or white Ecuadorian roses, plump hydrangeas, seasonal flowers and assorted greenery. Subject to seasonal availability. Elegant and sleek, this arrangement is comprised of our premium, white or green Ecuadorian roses, and specialty greenery to embellish. This sophisticated display of flowers is perfect for a modern or contemporary space. A tall and elegant arrangement comprised of our specialty green or white, Ecuadorian roses, lush hydrangeas, specialty greenery, as well as a wide arrange of fresh seasonal flowers. Suits a foyer or large, open space. Subject to seasonal availability. Arrangement comes in tall, clear glass vase. Our beautiful, classical garden style in a hand-tied bouquet. This lush bouquet is comprised of lovely, green or white Ecuadorian roses, plump hydrangeas, premium greenery, as well as the designer’s choice of fresh seasonal flowers. For a custom-tailored look, call us or book a consultation with our floral designer. We are able to create the perfect arrangement, whether it's an artful bouquet, striking centerpiece, outdoor oasis or décor for a special event.